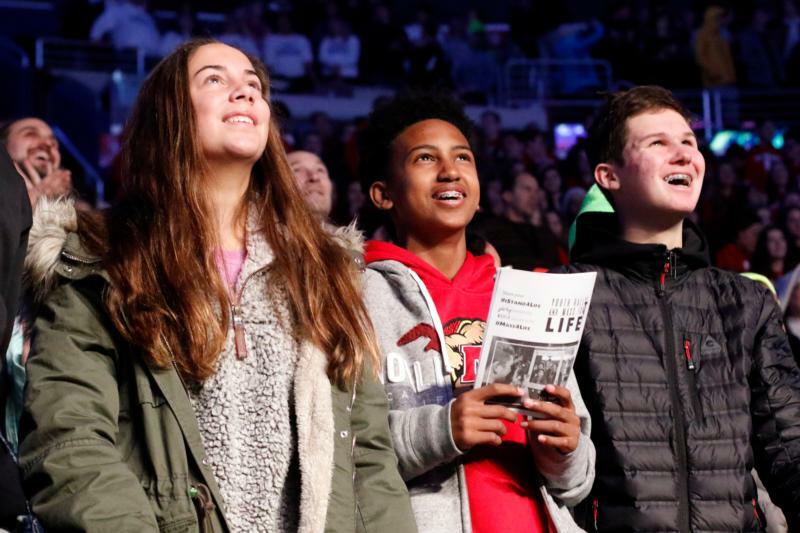 WASHINGTON (CNS) — They came from near and far, and even from Down Under, united in prayer and in standing together for life at the Archdiocese of Washington’s annual Youth Rally and Mass for Life, held Jan. 18 at the Capital One Arena in Washington. The estimated crowd of 18,000 came from the Washington area and from across the country and were joined by young adults from Sydney on their way to World Youth Day in Panama. The main celebrant at the Mass, Archbishop Christophe Pierre, the apostolic nuncio to the United States, entered and left the arena smiling and waving a blessing to the spirited crowd of teens and young adults, many of whom wore colorful, matching hats or sweatshirts along with their school uniforms. “Dear young people, thank you for the witness of your Catholic faith, both now in holy Mass, on the streets of Washington, and more importantly, when you return home to your families and neighborhoods,” he said. Archbishop Pierre read a message from Pope Francis, who said he was united in prayer with the thousands of young people who had come to Washington to join the March for Life. The pontiff in his message said the challenging task for each generation is “to uphold the inviolable dignity of human life.” The pope’s message said respect for the sacredness of every life is essential in building a just society, where every child, and every person, is welcomed as a brother and sister. Fifteen other bishops concelebrated the Mass including the president of the U.S. Conference of Catholic Bishops, Cardinal Daniel N. DiNardo of Galveston-Houston and Sydney Archbishop Anthony Fisher who was accompanying the Australian pilgrims. About 175 priests also concelebrated the Mass, assisted by about 30 permanent deacons. The arena crowd also included an estimated 500 seminarians and 100 women religious. Echoing concerns raised by Pope Francis, the priest called on young people to counteract society’s culture of indifference with a culture of encounter. He said it was a great joy for him to accompany the young Aussies on the March for Life. The Australian prelate said he hoped some of the young people in the arena would become priests or women religious or become “spouses and parents of the next generation of Christians… Whatever God’s plan for you, know you are precious in his eyes,” from the moment of conception until death, he said. Sister Maria Juan, a Religious Sister of Mercy of Alma, Michigan, served as a master of ceremony for the youth rally, and at the end of Mass, she noted the bishops and the large numbers of priests, women religious and seminarians there, and the crowd gave them sustained applause. Some of the young people stood to indicate that they were discerning a vocation, and they too were applauded. The Mass’s program encouraged young people to continue their advocacy for life after the march, by doing things like volunteering at a pregnancy center, starting or joining a pro-life club, educating peers on chastity and the church’s teaching on life, being open and loving to teens in crisis, and praying for mothers, fathers and unborn children. The Mass ended on a joyful note, as the congregation sang the song, “Your Grace is Enough,” and some of the bishops and priests as they processed out, waved to young people in the different sections of the arena. Zimmermann is editor of the Catholic Standard, archdiocesan newspaper of Washington.